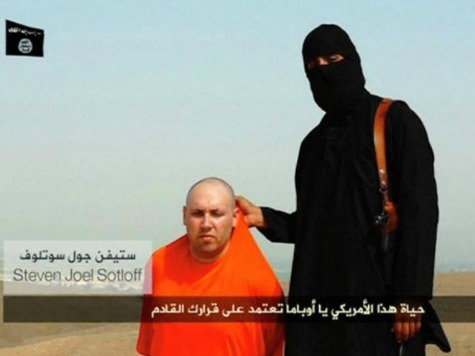 In a move unusual for a group known to have a sophisticated propaganda outfit, the jihadist terror group the Islamic State “apologized” yesterday after a video showing the beheading of American journalist Steven Sotloff surfaced online. The admission that the video’s publication was a mistake strengthens reports claiming the group is attempting to limit the number of beheadings the Islamic State posts online. According to a Twitter user known to work with the terrorist organization, the video surfaced online “by mistake”; it began circulating after a jihadist account, unaware that the video had appeared before publication time, began to disseminate it. The user saw a tweet with the video and thought it was published officially. “We tried to remove the video after we understood that his was published by mistake, and we are sorry to the followers of the Islamic State,” said Twitter user @Khattabyaz. The bizarre statement took many by surprise who have come to expect such brutality from the Islamic State. After all, the jihadist group did commit the beheading and did edit the video–which, like much of the Islamic State’s output, boasts high production value. But unlike the release of the predecessor to this video, which featured the beheading of American journalist James Wright Foley, the publication of “A Second Message to America” followed rumblings of an attempt by the Islamic State leaders to better control the release of beheading videos online. A report initially surfacing on Lebanese media, later circulating to Israel’s i24 News and Iran’s Ahlul Bayt News Agency, claimed this week that Islamic State leaders were cracking down on the beheading videos, issuing an effective ban on videos of beheadings that were not specially approved by jihadist higher-ups. The report followed not only the publication of the Foley video, which received significant international attention and triggered greater American military intervention in Iraq, but videos featuring the beheadings of a Kurdish man and Lebanese soldier that became particularly popular in jihadist circles. Given the tightly controlled nature of the Islamic State media, the ban would make sense. While beheading videos, particularly Foley’s, have increased awareness internationally of the murderous nature of the group, it also prompted a louder cry for an international response to stop the Islamic State, which has resulted in setbacks in areas in northern Iraq in which the jihadists were previously making some progress in ethnic cleansing and conquest. In addition to the practical reasons that may persuade the Islamic State leaders to tone down the violent imagery, this jihadist group in particular has made painstaking efforts to depict itself as a benevolent group to Muslims internationally. To attract distraught young Muslim men in Western countries–most of the international recruits to the Islamic State–much of the Islamic State propaganda includes images of happy children, emotional music videos, and Western terrorists describing their “joy” in waging jihad. A calculated balance of these images with violent beheadings to scare infidels into submission has significantly contributed to the Islamic State’s success in recruiting. Offsetting that balance could mean scaring off potential recruits, while attracting the wrath of Western militaries. As the response to the Islamic State’s propaganda evolves, so, too, will the propaganda itself, who controls it, and how it arrives to the masses.